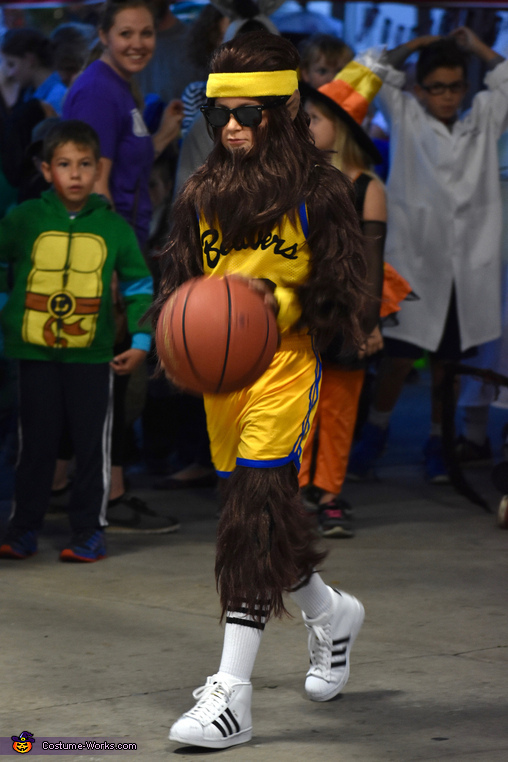 My son, Landon, watched the 1985 Teen Wolf movie, with Michael J Fox, this summer and immediately decided he wanted to be Teen Wolf for Halloween! After months of research I had finally devised a plan to make this costume. I began with making a duct tape mold of my son, to use as a manikin for the head to toe unitard I had ordered online. I then carefully cut up and glued hair from the six wigs I had purchased, using rubberized glue. A 70s man wig was used for the head and I used prosthetic glue to glue hair on his cheeks and chin for the final look. We made the old school basketball uniform and used vinyl lettering for the authentic look. I ordered the original shoes and socks from journeys. We found fangs at the local party store to complete the look. Landon loved the outcome of his costume! Approximately $350 and 20 hours to make the costume. It was so much fun!! !